Perfect for space-deprived desks and single-LCD computer setups. Excellent construction quality. Only one size and color option. Fixed keyboard tray can neither be tilted or removed. The platform does not adjust all the way down to the desktop for sitting, which leaves the keyboard floating about an inch above the desktop and a bit bouncy. Not a problem at any other height, just at the bottom of the range. 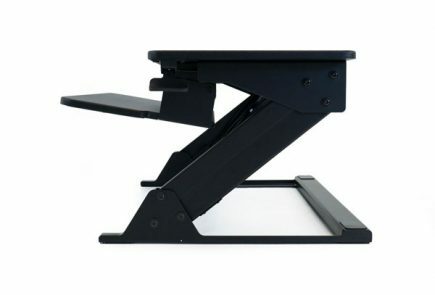 How Cheap Can a Quality Standing Desk Converter Get? 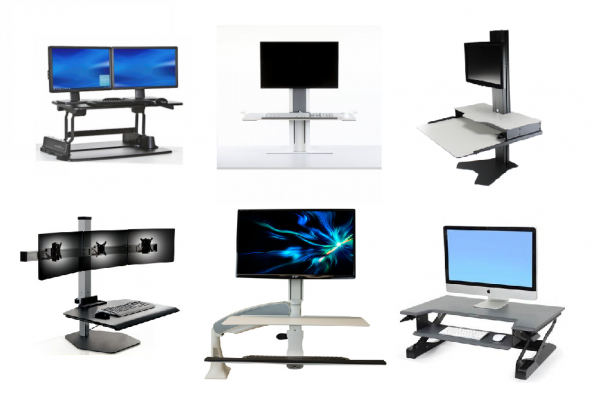 We’ve been reviewing and recommending Ergotron ergonomic monitor arms and standing desk converters for many years. And for the most part we categorize them as mid-priced, quality construction, and a good value, but usually not the cheapest that you can buy. This is especially true when it comes to standing desk converters where the competition from cheap Chinese knock-offs is stiff. With models like the Ergotron Workfit-TX priced at $479 there was definitely a hole in the Workfit standing desk converters line-up for a lower-cost, basic unit, and this Workfit-Z Mini is just what the doctor ordered. Inexpensive, very basic, but of reasonably high quality. Note that the WorkFit Z is designed to accommodate screens up to only 24”, and its weight capacity is 25 lbs, so those with larger or heavier monitor(s) should opt for a larger converter. 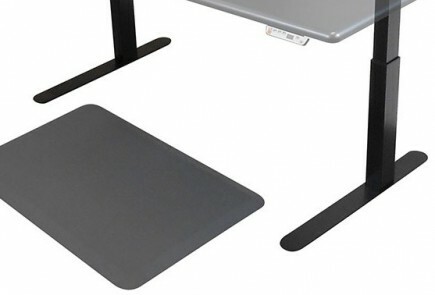 See our comprehensive round-up of Standing Desk Converter Reviews for other options. The Mini, as the name implies, is somewhat diminutive. That’s good news if you’re in a cramped space. Like ZipLift, Flexispot and a few other “Varidesk alternatives,” it’ll work on a 24”-deep desk surface. At 31” in width it is definitely one of the smallest units on the market. Also like the ZipLift and many Varidesk alternatives you can edge-clamp just about any monitor arm on the back edge, thought it should be noted that there are no grommet holes in the work surface, so edge-clamping is the only option. One of the drawbacks of Ergotron’s designs is the shallow depth of their keyboard trays. While nice looking, the scalloped design of the Mini’s keyboard tray gives you only 9” of depth in the center and 7.5” on the left and right ends. Surprisingly this was enough for holding one of the largest and most popular keyboards sold, the Microsoft Natural, just fine. Given that we have no reservations about they keyboard tray depth unless you’re using some exotic supersized gaming keyboard. The work surface features a handy tablet holder (typically, using your standing desk converter for just a tablet is overkill, but with a product this small, it’s a believable use-case). The Z comes in only one color scheme. An appealing grey-toned woodgrain finish which gives it an aesthetic edge over competitors, but it would be nice to see a plain black version available to better suite a wider variety of decors. Total height that can be achieved for the work surface is 17.9”. 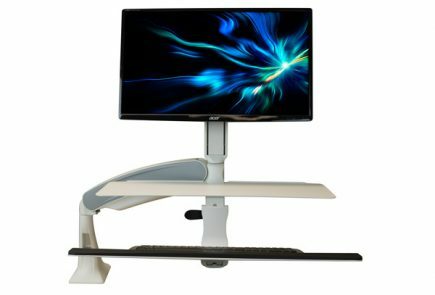 While this is a little better than Varidesk’s infamously too-low height adjustment range, yet is less than the 20” height-above-desktop that we see on units that cost $100 more, like the ZipLift. For the extraordinary tall folks out there this is one additional limitation to keep in mind. One slight annoyance with the Mini is that it doesn't lower all the way down to the desktop; it hovers about a half inch above it in its lowest adjustment position. One issue is that it raises your typing platform more than it should when you're seated, but the worse problem is that the X-lift mechanism doesn't lock firmly, so there's a bounce in the keyboard when you type while seated. But again, we've seen a lot worse at the $249 price point... this is minor design glitch relative to other sub-$300 converters that we've tested. Yes, we can give a four-star recommendation on this unit for being what it is… a very inexpensive yet well-made and reliable standing desk converters for space-starved users. While limited in size and color options to just one version, it will go where few other converters can. The Workfit-Z Mini was designed in the USA and is manufactured in China. Subscribe to our newsletter for the latest updates, and be sure to check out our comprehensive comparison review of standing desk converters of all types. Shipping is included in the $249 price. The Workfit-Z Mini comes with a 2-year warranty, which is less than the 5 years they offer on their other Workfit sit-stand stations, but given the high quality of construction on the Mini, and the price point, two years seems adequate.